CD review: "Never Give It Up"
This review first appeared in the July 10, 2001 edition of the American Reporter. Michael Rose's increasing popularity, his crossover appeal, and his radio-friendly dance-ready songs are moving him beyond the reggae orbit. 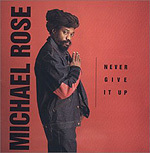 Like Sly and Robbie, who seamlessly melded reggae back beats with immediately accessible melodic hooks in the mid-'80s, Rose is making a substantial pop base for himself in the new century. Of course, Rose is no stranger to pop-oriented reggae. As a founding member of Black Uhuru, Rose has long been successful at reaching beyond the hard-core reggae crowd and into college campuses, alternative radio stations, and popular music festivals. His latest album, "Never Give It Up," is full of yet more of his personable, warm songs  songs whose musical beauty in no way subtracts from the punch of his lyrics. His new release takes on gang violence, the fast pace of modern life, and poverty. Songs like "Never Give it Up" and "Jailhouse Call" seem destined for heavy airplay, although the increasingly shrinking playlists at most radio stations may deny these bits of classic bit of pop music their deserved exposure. On the downside is the fact that Rose's lyrics seem to get darker and darker. Social consciousness need not be cynical; in fact, the best protest music has always held out the hope of a better future  no blind optimism, but a simple recognition that we all have a say in what the future holds. It would be nice to see Rose rediscover his own faith in humanity.